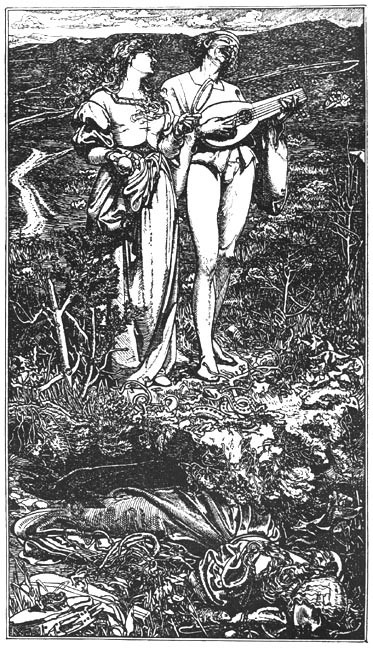 Victorian wood-engraving was dominated by the mighty triumvirate of Dalziel and Co, William Linton and Joseph Swain, whose businesses dominated the period from the 1840s to the 1880s, when the art of the woodblock was superseded by photographic techniques. The heads of each of these companies directed the cutting of blocks using the intermediaries of managers and foremen, but the work itself was done by a mixture of master-engravers, experienced craftsmen and apprentices. Known, collectively as ‘peckers’ or ‘wood-peckers’, these artisans were employed to make relief prints out of boxwood. It was exacting work, requiring a number of skills and a certain mind-set. Precision was required to cut the lines on the block, but it also demanded a degree of artistic understanding and the capacity to interpret in a linear form what might only be suggested by a drawing. Keen eyesight was always needed with the expectation that some of the engraving would be done with gaslight the only illumination, working late into the evening to meet a deadline; perseverance and unrelenting focus were required and so was physical strength as the engraver toiled to manipulate the various gravers and gouge out a design into the hard surface. Never less than arduous, demanding both intellectual acuity and stamina, engraving on wood further demanded a willingness to labour without recognition, as pieces were passed between several hands to engrave parts of the block. Moreover, the signature inscribed on the wood would usually be the director’s, not the craftsman’s, whose contribution was essentially anonymous. ‘It is matter of regret’, Goldman notes, ‘that the individual names of these practitioners [were so] rarely recorded’. These ‘forgotten people’ (35), the toilers who made the craft possible and supported a vast industry, were essentially invisible. All that remains is their unacknowledged work. There were however some exceptions. 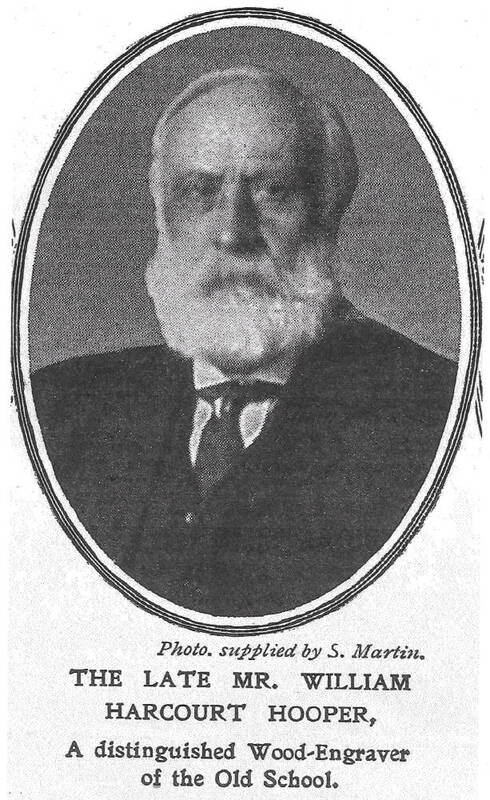 One such figure was William Harcourt Hooper (22 February, 1834–24 February, 1912). Hooper was a master engraver at Swain’s, producing cuts which were signed, for the most part, by his employer; but he also worked as Swain’s manager and later became a significant figure in his own right. 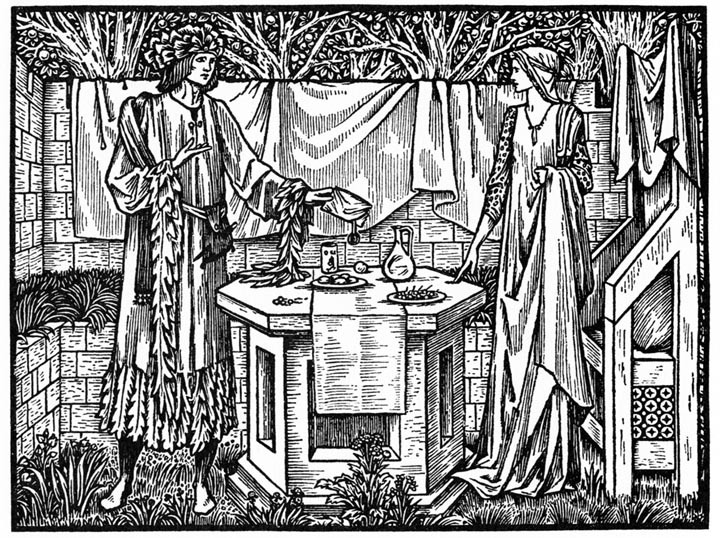 Interestingly, he lived long enough to outlive changes in taste: he started in the commercial world of mass wood-engraving, but he later became the engraver for William Morris’s Kelmscott Press as well as working for Charles Gere and other private presses. Trained in the rapid turn-around associated with industrial production, he was still able to service the handicraft revival of the end of the century. Hooper trained in the 40s and 50s in the workshop of Thomas Bolton, a minor engraver best known for inventing (in 1860) the process of photographic transfer by which an exact facsimile could be created on the block. He also studied, in or around 1856, at F. D. Maurice’s Working Man’s College. Here he engaged with the principles of composition – as it was chaotically taught by Dante Rossetti – and he also studied the drawing of landscape, the section delivered by John Ruskin (Morris, Letters, 3: 287). Hooper was a self-proclaimed Socialist and seemed to relish his status as a highly-skilled artisan. However, it is interesting to note that he actively opposed Ruskin’s idea that the craftsman should be an active participant or co-author in the production of fine art. Hooper regarded himself as a ‘facsimile man’, who existed purely to translate the artist’s design into a cut. Writing in 1899 to the collector William Abercrombie, he positions himself in opposition to the Socialist engraver William Linton, who endorsed Ruskinian principles. The woodpecker, Hooper insists, should be no more than a technical medium, capturing the artist’s ‘character and feeling’ and making sure to ‘sacrifice his own individuality’ (Roob & Cooper). This self-abnegation seems curiously at odds with Socialist principles, asserting a hierarchical structure and upholding the artist’s status when it was obviously the case that engravings were the product of collaboration. Hooper’s strict adherence to what most commentators would regard as an anti-Socialist position was useful in some of his roles and positively disadvantageous in others. Hooper joined The Illustrated London News in the late fifties and it was here that his particular emphasis on the engraver’s neutrality was put to good purpose, producing journalistic cuts in great numbers and processed to a tight schedule. Here, it could be argued, the artist’s personality was relatively unimportant and the engraver more a technician than an interpreter, creating images in which for the most part the effect was descriptive rather than expressive. Such differences suggest how even a minor change of emphasis could change the impact of an image, and almost all of Hooper’s work is more expressive and suggestive than the characterless cutting that he proposed. In these designs, as in the practice of the best engravers, there is a strong sense of his contribution to the artist’s meanings, helping to promote the best work of John Leech, Frederick Walker and Fred Leighton. 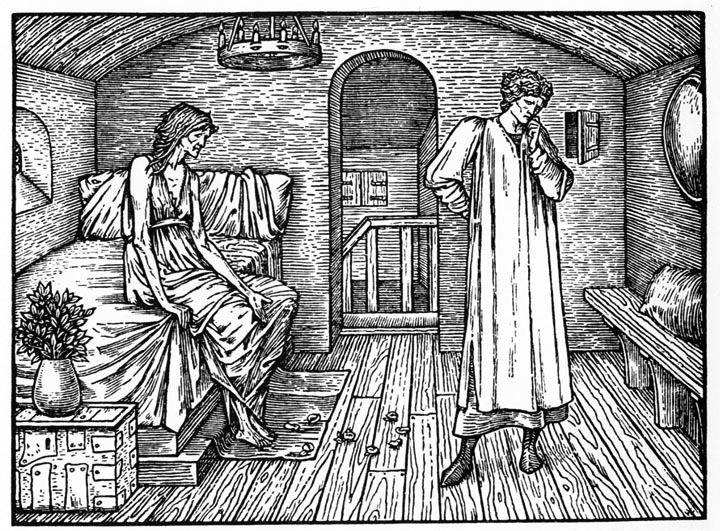 Nevertheless, Hooper continued to insist on his status as a facsimile-maker, an attitude he carried forward to his employment as the chief engraver at William Morris’s Kelmscott Press (1891–6), notably cutting the famous edition of Chaucer. Here, we might surmise, the Socialist Hooper and the Socialist Morris would have agreed on the engraver’s approach to the work. This was not the case. Hooper insisted he was just a technician, while Morris demanded that his craftsman was not merely ‘the tool of the artist-designer’ (Peterson, 147). Hooper seems to have gone out his way to contradict his employer’s Ruskinian idealism, and Morris complained that his work lacked any sense of creative engagement; he thought that his borders were mechanical and uninspired, and described his initials as ‘unintelligent’ (Letters, 3:148). At the very moment when character was required in the manner of an Arts and Crafts artisan, Hooper puritanically asserted his non-assertion. 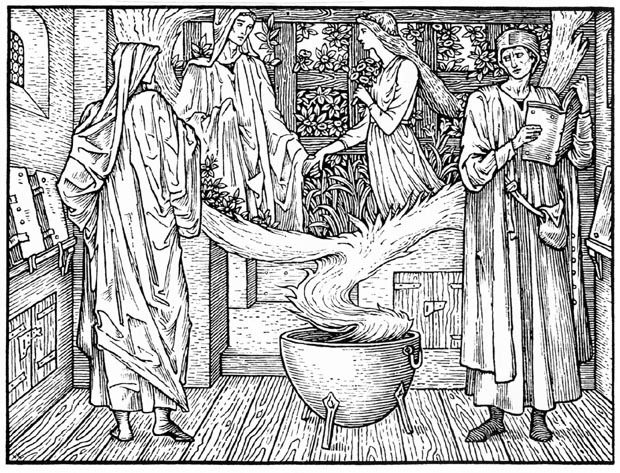 Nevertheless, he remained the Press’s prime engraver and was responsible for translating most of Morris’s decorative work as well as working on Edward Burne-Jones’s illustrations. This paradoxical position – embodied in the protestations of a self-denying artisan in a company dedicated to advancing its artisans’ power and influence – had a final, unexpected turn. Supposedly just an industrial worker, Hooper went on to promote the aesthetics of handicraft beyond the limits of Morris and Co. He worked for C. R. Ashbee and Charles Gere, engraving work for the Essex House and Ashdene Presses, and he tutored Charles Ricketts and Charles Shannon, teaching them how to cut on wood in order to illustrate books for the Vale (York, 161). Hooper’s professional career might thus be described as a conundrum, full of contradiction. Though a Socialist, he avoided the idea of sharing in the creative act and subjugated himself to the industrial process, supporting, rather than challenging, the dominant capitalist structures in which the classes were divided into manual and brain-workers; and though he believed in the impersonal nature of craftsmanship, he tutored designers who produced deeply idiosyncratic work. A complex figure, he made a small but significant contribution to the art and craft of his time. More than this, his work highlights the social, professional and artistic tensions that lie at the heart of what appears to be nothing more than pecking on wood. Proofs are held in The Hartley Collection, Museum of Fine Arts, Boston, and The British Museum, London, which houses more than five hundred items. The most important collection of correspondence can be found in the University of Iowa, Iowa City. This archive awaits detailed investigation. Elzea, Betty. Frederick Sandys, 1829–1904. With an introduction by Douglas E. Schoenherr. Woodbridge: Antiques Collectors’ Club, 2001. < p class ="bibl">Goldman, Paul. Beyond Decoration: the Illustrations of John Everett Millais. London: The British Library, 2005. [Morris, William]. The Collected Letters of William Morris. Vol, 3. Ed. Norman Kelvin. Princeton, NJ: Princeton University Press, 1984–96. 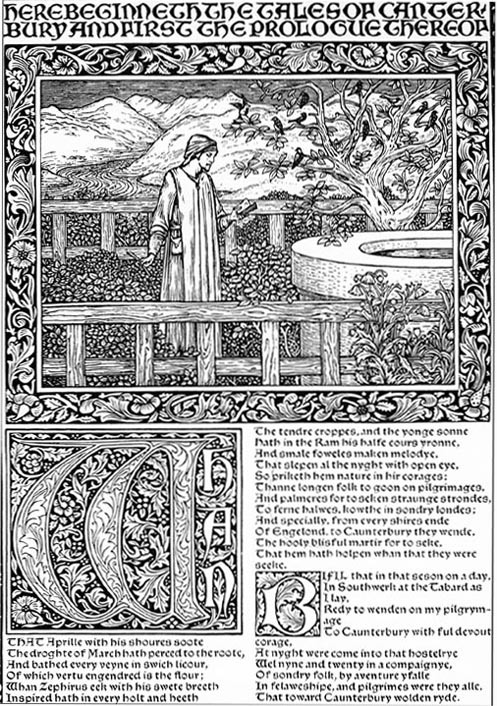 Peterson, William S.The Kelmscott Press: A History of William Morris’s Typographical Adventure. Oxford: The Clarendon Press, 1991. Roob, Alexander & Cooper, Jeff. Art or Craft – Linton v. William Morris. Düsseldorf: Melton Prior Institute [online version]. York, Malcolm.Eric Gill: Man of Flesh and Spirit. London: Constable, 1961.